Jigsaw’s New ZAP-EB App enables eBay Sellers to affordably and easily create and embed personalized, image-based Zoom and Point (ZAP) Listing Videos to enhance product sales. ZAP-EB is the first super easy-to-use, free app that enables eBay Sellers to harness the power of video for their listings. Jigsaw Informatics, Inc.® (“Jigsaw”) announced today that ZAP-EB™, the first affordable, easy-to-use Zoom and Point™ Video Maker App for eBay® Sellers, is now available on the App Store at https://appsto.re/us/Brss8.i. An overview of ZAP-EB, including a highlight video and ZAP-EB example listing videos may be viewed at http://www.ZAP-EB.com. Jim Krachenfels from JQmktg will demo ZAP-EB at the Bay Area eBay and eCommerce Sellers Meetup tonight (Tuesday, August 25, 2015) at 7:00 PM at eBay, Inc., 2065 Hamilton Avenue, San Jose, CA (see http://www.meetup.com/eBay-Sellers/events/224288288 for more info). Optimized for Apple iPhones, iPads and iPod touch mobile devices running iOS 7 or later, ZAP-EB is an easy-to-use app that enables eBay sellers with a wide range of technical skills to easily create Zoom and Point (or ZAP) videos from their product photos using their own voice narration and touchscreen gestures, upload them on YouTube and easily embed them in their eBay listings. Unlike slide-show apps or hard-to-use video editing tools, ZAP-EB employs Jigsaw’s patent-pending Zoom and Point™ (ZAP) technology that lets users intuitively interact with their photos to highlight and clarify specific details that are important to buyers and to stand out from the competition. With the free version of ZAP-EB, users can create a personalized ZAP Video with up to three images that is thirty seconds long, which is perfect for quick product introductions. With the ZAP Plus in-app purchase, users can create ZAP Videos with up to 12 images that are two minutes long, which is ideal for video overviews of their products. ZAP-EB also allows users to easily add a background music track to the ZAP Videos they create for a more polished effect. “We’ve been working with the Jigsaw team on ZAP-EB for some time now, to make sure that the app has the features and the ease-of-use that’s essential for the eBay Seller community,” said Jim Krachenfels, principal consultant at JQmktg, which provides training and support services to eBay Sellers using ZAP-EB. “The eBay sellers with whom we've worked so far have indicated that ZAP-EB will truly help them to sell quicker, achieve their sales price targets, and maximize profits—all of which are important in today’s competitive online selling environment.” For more information on the services provided by JQmktg, please visit http://www.jqmktg.com. Creating listing videos using conventional video creation and editing tools is complex, tedious and time consuming, which is why online sellers typically do not add videos to their listings, even though they have proven to be very effective. Using ZAP-EB, eBay sellers simply select or take pictures on their mobile device and then, at their convenience, record a ZAP Video while narrating and interacting with their photos using familiar touchscreen gestures (i.e., swiping, zooming and pointing). When finished, the seller has created a personally narrated ZAP Video message that combines their photos, voice narration and highlights that precisely convey the key selling points of their products much better than pictures and text alone. Using the automated features of ZAP-EB, users can then readily upload their ZAP Video to YouTube and the app will provide them with the specific eBay Embed Code that they can easily add to their eBay Listing Description. In addition, ZAP-EB users can also save their ZAP Video locally on their device or share the video with customers, colleagues and friends by text, email, or Facebook. With ZAP-EB, the video encoding occurs locally, so internet connections are not required for message creation. Also, with ZAP-EB, users retain control over their content, which avoids the privacy issues common to many content creation apps. The free version of ZAP-EB supports videos with three images (from camera or photo library) and a 30 second duration. ZAP-EB also supports In-App Purchases for more images (12) and longer duration (two minutes), available for $1.99 (limited time offer), as well as removal of the ZAP-EB Signature Page and Watermark, available for $4.99. ZAP-EB also supports background music tracks and the ability to open ZAP-EB directly from popular photo editing apps. ZAP-EB is Jigsaw’s latest “Vertical Market” ZAP Video Maker App, which brings the power of Jigsaw’s patent-pending ZAP 2.0 technology and ease-of-use platform to specific markets where improved communications between users, customers, clients and colleagues has significant value. Private label versions of ZAP-EB, which include seller branding to meet seller’s needs is also available for sellers via the Apple Volume Purchase Program (VPP). 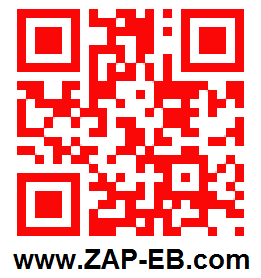 eBay sellers interested in licensing a private label version of ZAP-EB should send email to info@jigsaw.info. 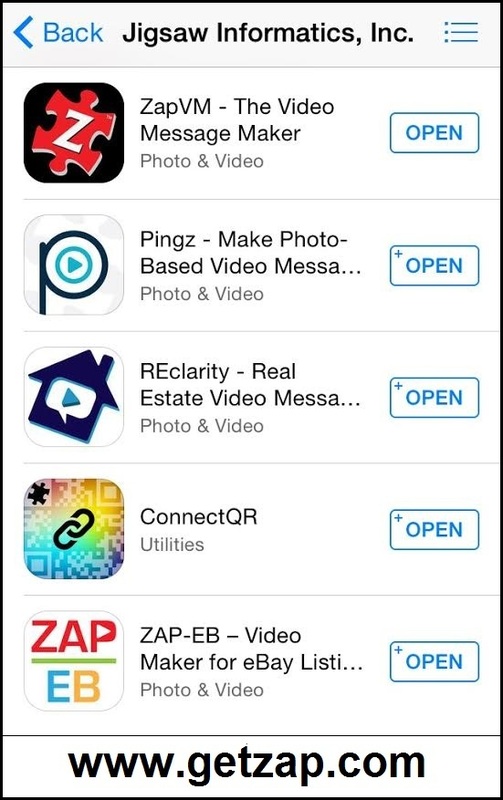 ZAP 2.0 technology is also employed in REclarity™, Jigsaw’s ZAP Video Maker App for Real Estate Professionals, and Pingz™, Jigsaw’s ZAP Video Maker App for Consumers. Information on REclarity and Pingz is available at http://www.REclarity.net and http://www.pingzapp.com, respectively. Jigsaw Informatics is a Silicon Valley startup founded by seasoned tech pioneers whose mission is to help mobile device users solve information problems through app-specific tools and clever accessories designed to change how they communicate. Free apps available from Jigsaw today on the App Store include ConnectQR™ QR code creation app and ZapVM, ZAP-EB, REclarity and Pingz which are based on the ZAP 2.0 technology and ease-of-use platform for image-based, Zoom and Point (ZAP) video message creation and sharing, all of which enable mobile device users to create and share integrated, multimedia messages that document important aspects of life, whether business or personal, serious or fun, practical or entertaining. For more info please visit http://www.jigsaw.info. ZAP-EB, REclarity, Pingz, ConnectQR and their respective logos, “Stop Typing, Start Talking”, “Zoom and Point” and “Change How You Communicate”, are trademarks and Jigsaw Informatics, the Jigsaw and ZapVM logos and “You’ve Been Zapped” are registered trademarks of Jigsaw Informatics, Inc. All Rights reserved. eBay is the registered trademark of eBay, Inc. All other trademarks are the property of their respective owners.